We're seeing a similar issue to ZBX-6495. Sorry for the duplicate but I didn't know whether that closed ticket would get re-opened (it still appears as closed). I think we are seeing the same issue. We have 2.1.4 and get the following errors in the zabbix server log when using SNMPv3 with devices. 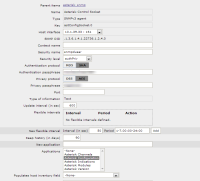 The same details and auth types in SNMPWALK work fine. To make it even more odd the error flap about as you can see from the logs. Some checks it comes back with valid numbers, other checks it comes back with an authentication error. If you look at the items screen of the device and refresh you can see the checks fail then randomly pass, then fail. Happy to provide screenshots and the like.